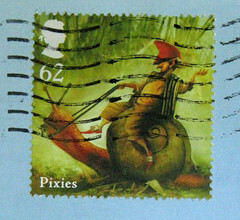 This fine handmade envelope came from the lovely Zoë. 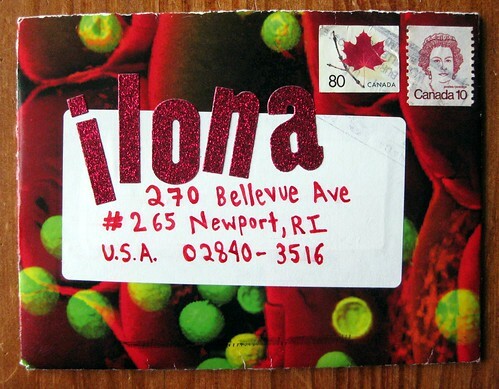 I am so taken with those sparkly, puffy red letters! They were sticking on very well, and must be low-profile enough not to cause problems in any sorting machines. I was a bit surprised they came through so unscathed, because they definitely have a texture that sticks up from the envelope. Zoë made this envelope herself, and she has become quite the devotee of making her own envelopes: she even has a fairly new etsy shop, strandedhero, where she sells her handmade envelopes and photo postcards. my first mail on your blog! That's so exciting :) I'm glad you enjoyed them, I love those stickers too and they went perfect with that microscopy envelopes. I'm glad to know they traveled safely. thanks for linking to my shop, I really appreciate it :) good luck moving too. gotta love the handmade envies . I make mine out of maps . 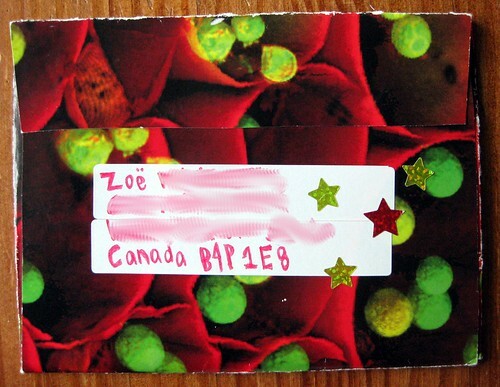 Hey Zoë - I've blogged about your mail before! My pleasure linking to your shop. I had meant to do it earlier... and good luck with that lovely endeavor.